CL20R is a rechargeable high-performance camping lantern. 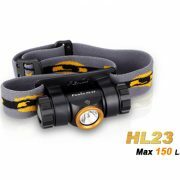 It is fitted with neutral white LED’s and red LED’s, which emits a max output of 300 lumens. 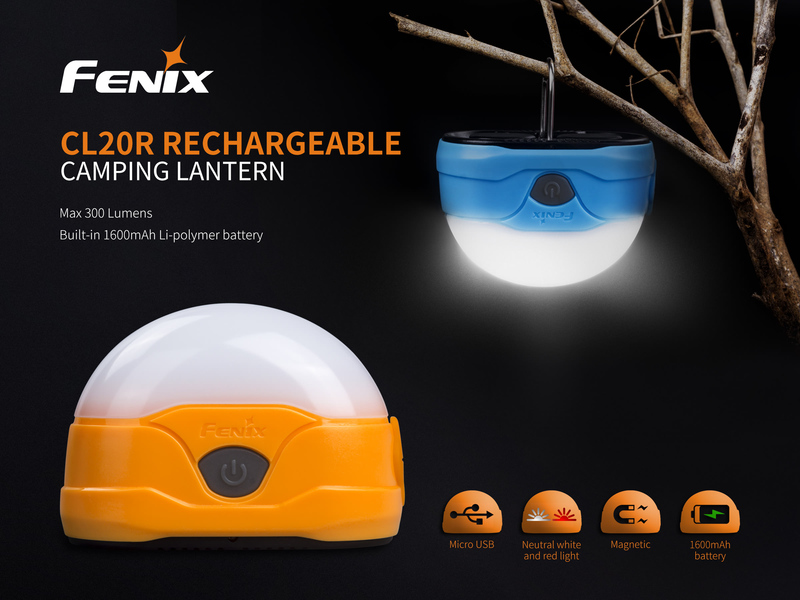 CL20R is a rechargeable high-performance camping lantern. 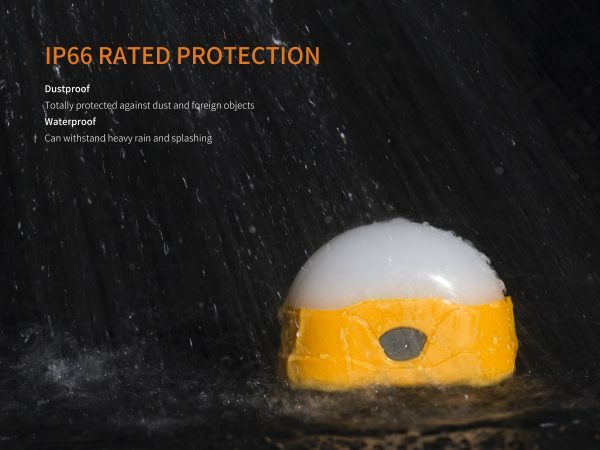 It is fitted with neutral white LED’s and red LED’s, which emits a max output of 300 lumens. 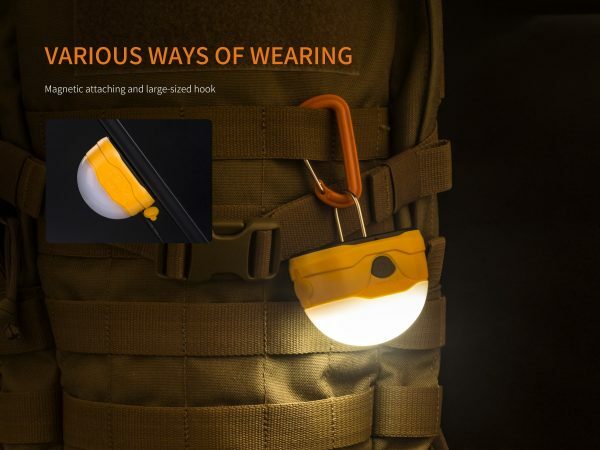 The white light features 4 output levels and the red with 2, perfectly meet the lighting demands in various camping environments. 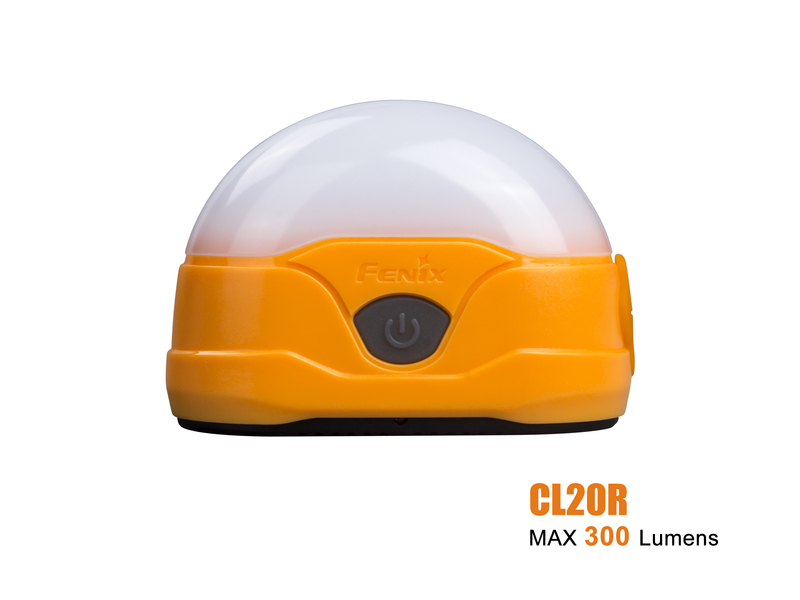 Powered by the built-in 1600mAh Li-polymer battery, CL20R also features charging and battery level indication function. The classic appearance inherits “Little snail”, simple but lovable. In addition, the IP66 rated protection, magnetic bottom and hanging loop make the CL20R portable and convenient as the exceptional camping lantern. Press and hold the switch for 0.5 seconds to turn on/off the lantern. With the lantern turned on, double click to enter red lantern, double click once again to return to white lantern. Press and hold for 0.5 seconds to turn off the lantern. 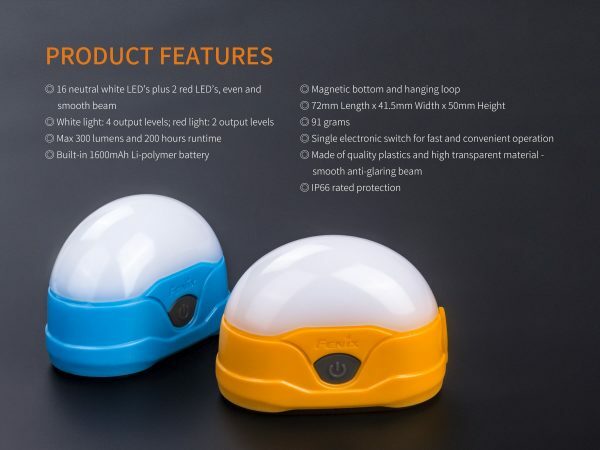 Remove the anti-dust cover to reveal the charging port of the camping lantern and plug the Micro USB terminal of the charging cable into it. If the battery level is fairly sufficient, the charging indicator displays green to indicate unnecessary charging. Or the charging indicator will display red while charging, and will turn to solid green when fully charged. 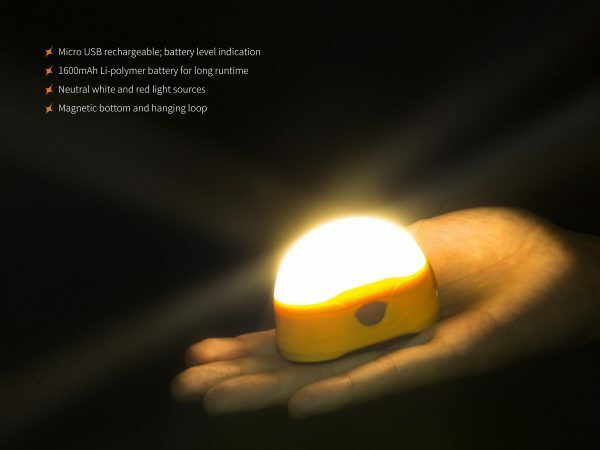 The normal charging time of the built-in 1600mAh battery is approximately 1 hour and 40 minutes from out of power to fully charged with the light off. Once charging is completed, be sure to remove the charging cable and replace the anti-dust cover to maintain the waterproof ability. 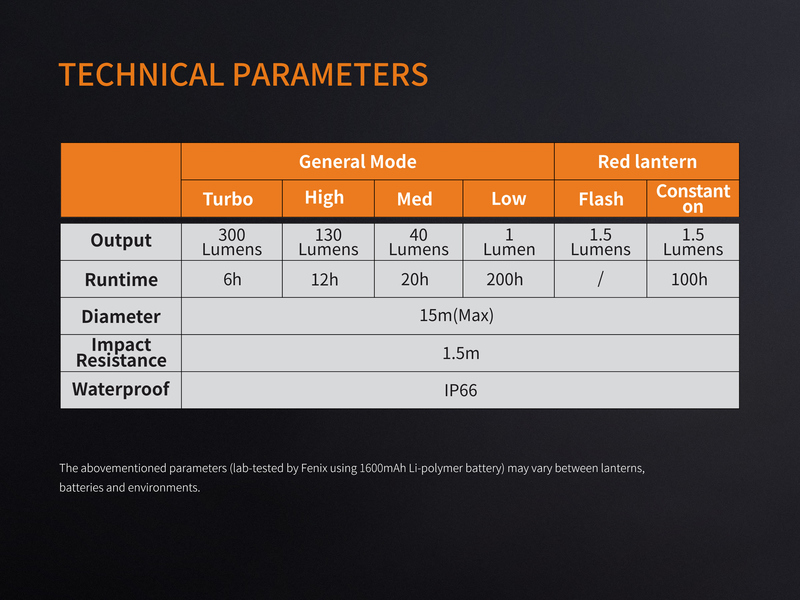 *The lantern can only be used on Low and Med output when charging, but the charging time will be prolonged. 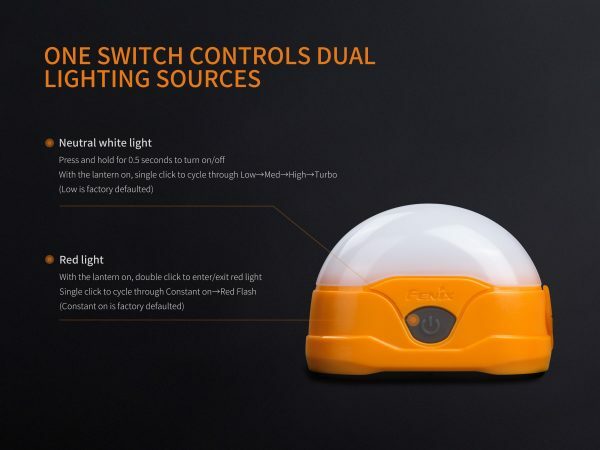 When the lantern is turned off, single click the switch, the battery level indicator on the side switch will display the battery status for 3 seconds. 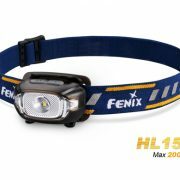 The Fenix HL15 is a lightweight running headlamp. 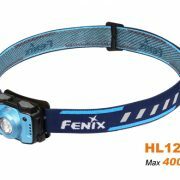 It is equipped with a reflective headband, one neutral white LED for better color rendering, and two red LEDs to alert others. Featuring four brightness levels plus IP67 waterproof classification, the HL15 is perfect for road running, hiking, camping etc.